What's Skow-ing on in 4th Grade?? : 4th Grade Common Core!! I have recovered from Christmas and have been working on several school projects over vacation. I am really excited to share my latest addition to the TpT website. 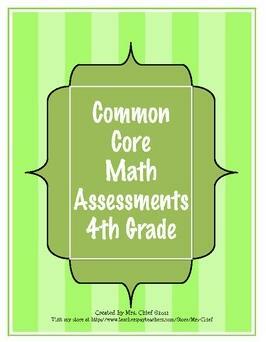 I have been looking to make math assessments for each of the common core standards to use with my 4th graders. I wanted them to be simple and sweet--a quick way to assess student mastery of each standard. I am proud to share that they are finally completed and available on my TpT site. While this was made to assess the 4th grade standards, it could also be useful in 3rd grade for enrichment or 5th grade for remediation. I will be working on the other grade levels over the next few weeks. When you visit my TpT store, there is a downloadable preview. Go Common Core!